Size: 22" Seat, Arm Style: Detachable Desk Arms - SHIPS FREE! Sentra Reclining Wheelchairs from Drive Medical are some of the most unique and practical Mobility Aids for patients. 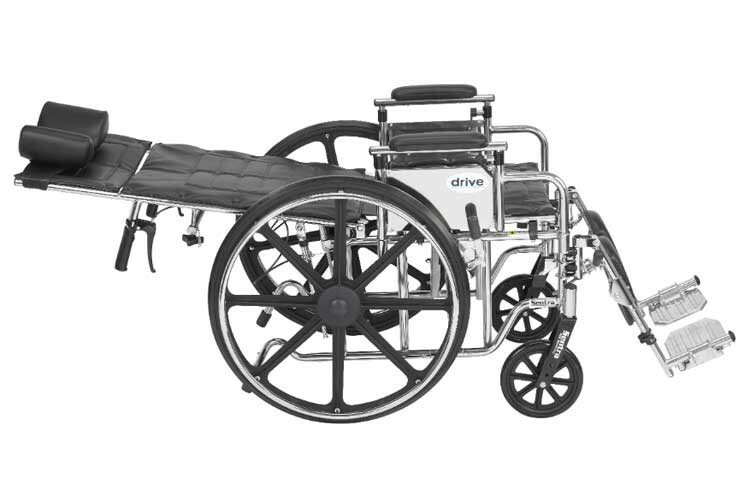 Drive Medical has produced this Full Reclining Wheelchair to meet the needs of more patients. Using a new state-of-the-art hydraulic reclining mechanism, this Bariatric Wheelchair allows for infinite adjustments up to 180 degrees. The seat is composed of durable, heavy gauge naugahyde upholstery, and with padded arm rests, the seat is extraordinarily comfortable. The seat is attached to a carbon steel frame that is triple coated with chrome for an attractive, chip-proof, maintainable finish. 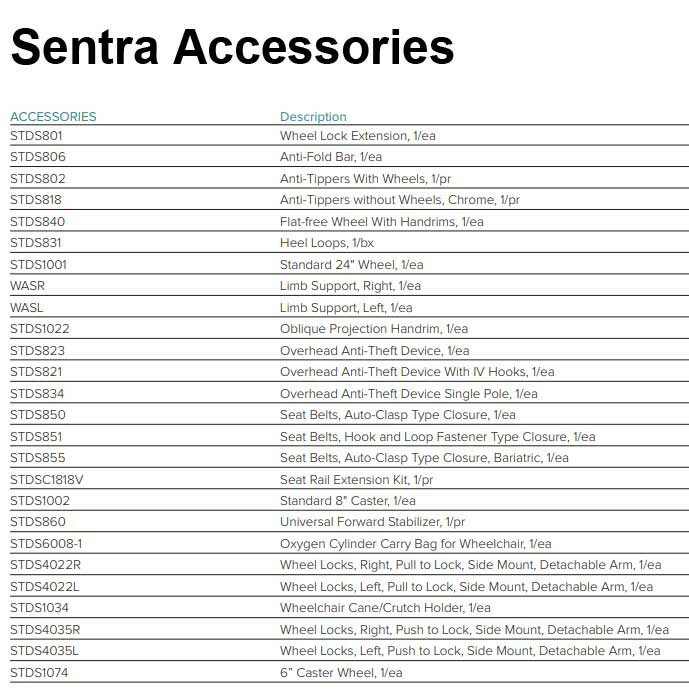 Sentra Bariatric Full Reclining Wheelchairs rolls on Composite Mag-style rear wheels with chrome hand rims attached. 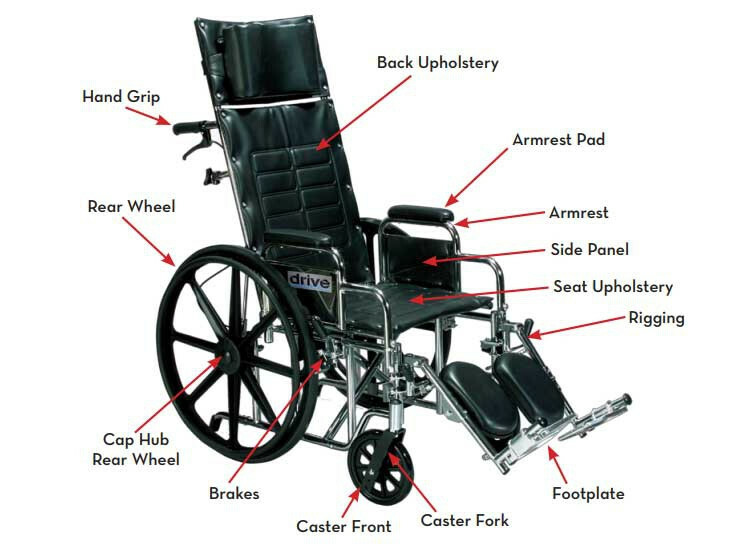 The wheels of the Sentra Full Reclining Wheelchair have been set back on the frame so that as the patient reclines, the chair doesn't tip. Rear anti-tipers are also standard to help the chair stay upright at all times. Also, the wheels use precision sealed wheel bearings in the front and rear to reduce maintenance and ensure long lasting performance and reliability. 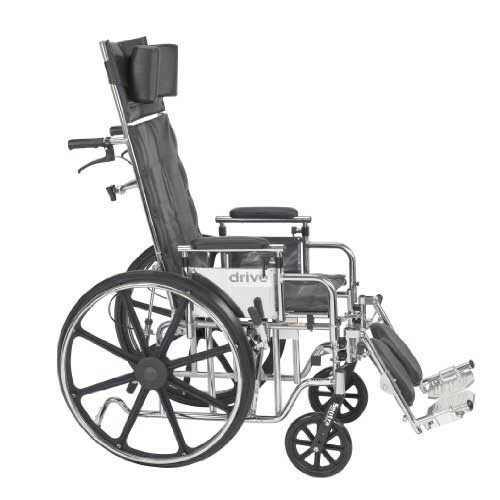 The 8" front casters are set in forks that are adjustable in 3 positions. Also adjustable are the legrests, which elevate easily and smoothly. 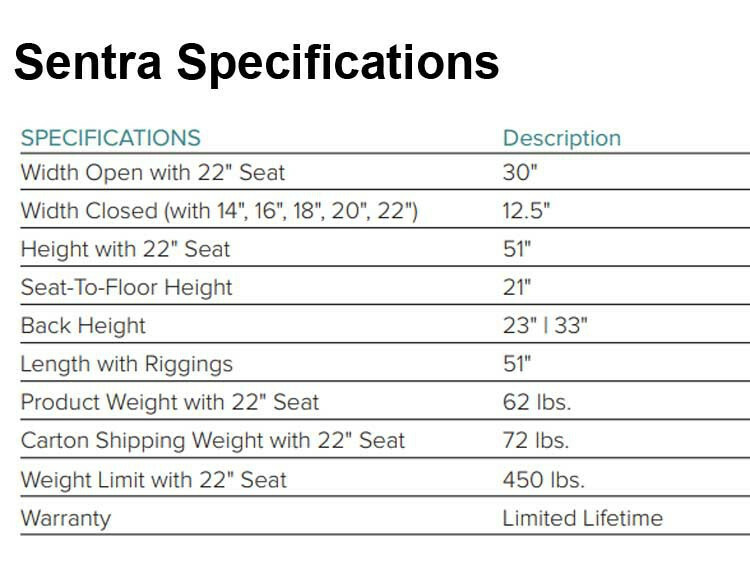 Drive Medical wanted to make the Sentra Full Reclining Chair as convienent as possible and therefore have included as standard components: a dual axle design, push to lock wheel locks, a carry pocket, and a headrest extension with cushioned head immobilizer. Also standard are Swing-away Elevating Legrests. Padded Calf legrests are also available but must be purchased seperately. Check "Related Products" at the bottom of the page to find the riggings you're looking for. Easy to fold, recline, and roll; the Sentra Bariatric Full Reclining Wheelchair comes with Limited Lifetime Warranty. 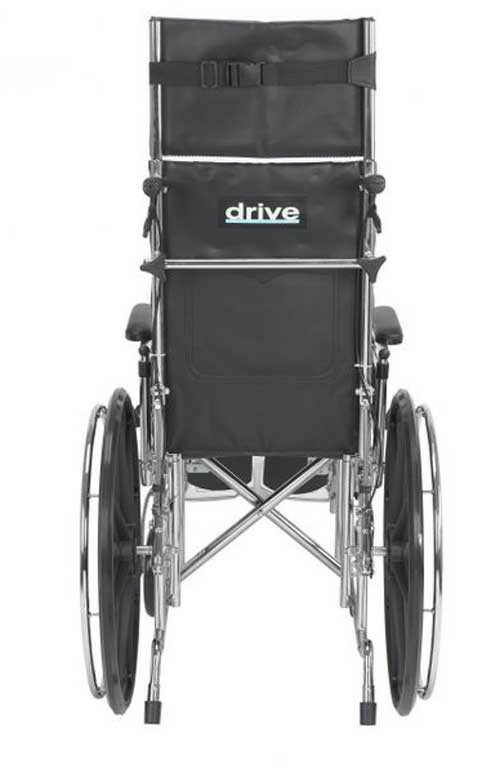 Drive Medical also manufactures standard Full Relclining Wheelchairs under the Sentra brand. 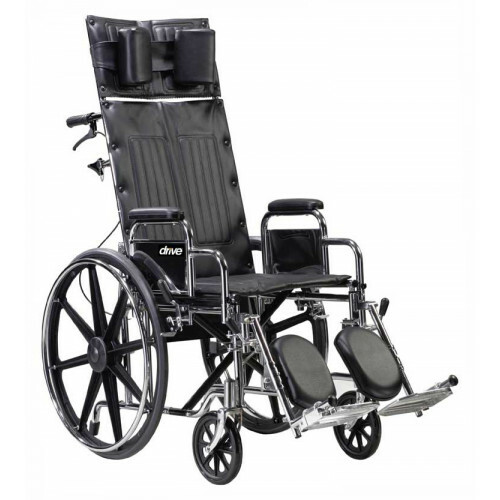 Back Height w/Headrest: 23" / 33"
Drive Medical Sentra Full Reclining Wheelchair Warranty: Limited Lifetime Warranty. How easily and how much does this chair break down for travel? 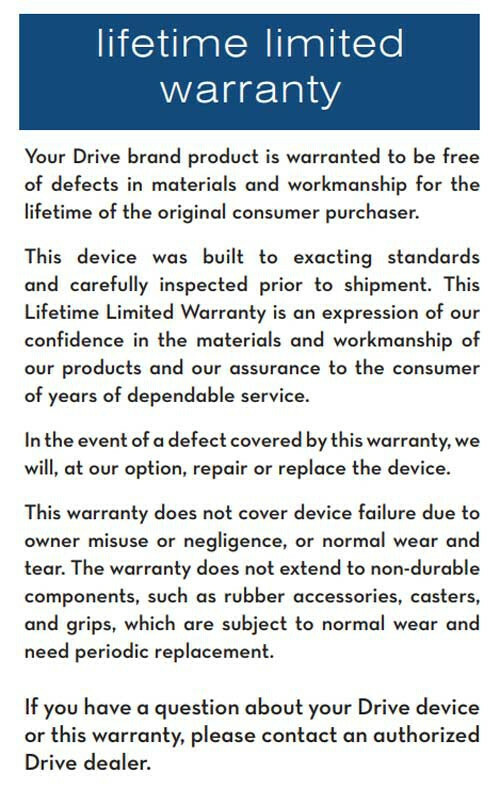 These are courtesy of the manufacturer, Drive Medical. This Chair is amazing, very comfortable and well built. I ordered the table with it and it was shrunk wrapped to the outside of the box, and every corner got smashed so order table separately.